This App is my Contribution to the Search and Rescue Contest of Wolfie6020. The App computes a Search Pattern from given Locations of an Airport Base and a Most Probable Position (MPP) of a search target, given some Airplane and Mission Parameters. Note: This App may not be used for real Search and Rescue Operations. It is for demonstration purposes only! Given are the Latitude and Longitude of the MPP. Find the nearest Airport with a runway length of at least 2000 m and use it as the Base for the Mission. The Size and Spacing of the Search Grid is given by 60 × 60 nmi and 5 nmi. The Search Entry Point has to be the farthest Grid Point on the same side as the Base. If more than Bingo Fuel is left after flying the Grid, the search is continued back and forth on the Grid until Bingo Fuel is reached. Bingo Fuel is the sum of fuel needed to fly back to the Base plus the fixed Reserve that has to be in the tanks after return to the Base. The search has to be stoped before Bingo Fuel is reached. To determine the Base airport you can use the Website www.airservicesaustralia.com . The Airplane Parameters are given as shown in the Input Parameters. Show the Map you have used - Plot MPP and Search Entry point on this map. They departed Hobart Australia eight days ago sailing for Perth in a small yacht. Last radio contact was twelve hours ago on a maritime distress frequency. More infos in the Mission Briefing on Wolfie's Video . The App uses spherical Coordinates given as Latitude and Longitude. The computed Contest Data is presented in the Mission Plan, the Flight Path and the Flight Plan. You can enter latitude and longitude values in the input fields in all common formats. Latitude Grid Spacing is 5° or about 300 nmi. 1° corresponds to about 60 nmi (nmi = Nautical Miles). The App computes the Flight Plan based on a perfect spherical Earth. Wind is not taken into account. The search grid waypoints are longitude corrected, so the great circle distance between two points of a leg is always Grid Width nautical miles. All legs are great circles. This means the grid is not flown along latitude/longitude lines. This results in headings not equal extact 0/90/180/270 degress in the flight plan. If the search fuel is more than needed to complete one full grid, the search continues back and forward until there is no more fuel for an additonal full leg left, without touching the Bingo Fuel. The back flight is calculated from the endpoint of the last flown leg back to the base. Flat Earth Contest - Search and Rescue Pre Mission Briefing. Search and Rescue Contest - 48 Hour Alert. How is this Mission on a Flat Earth different than on the Globe Earth? 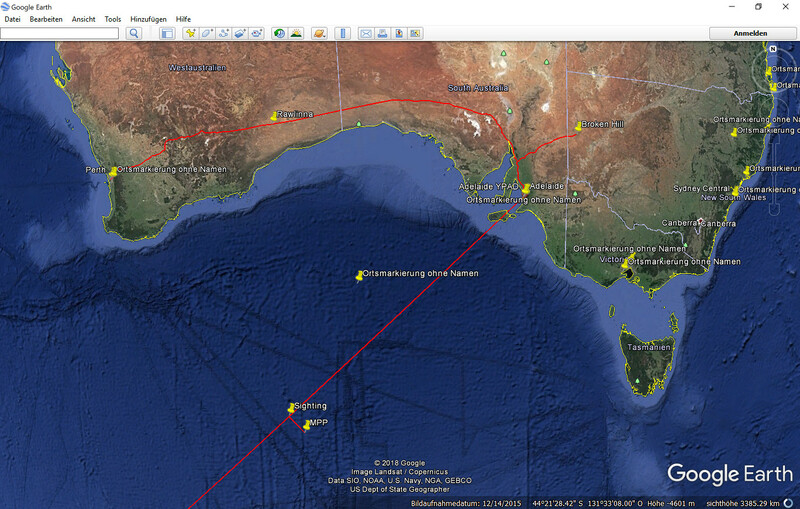 According to the Flat Earth Map the missing vessel would lie midst in Australia, not in the water south of it. Even if the correct MPP were choosen on the Flat Earth, the flight plan on the Flat Earth for the search pattern would differ greatly from real Flight Plans, if they even could provide one. Look at the Input Parameters to see what aircraft values are given to compute the mission. Additionally the Base airport and the MPP (Most Probable Position) coordinates as latitude and longitude is needed. In the following we ignore any wind and drift influences to make the calculations earier for demonstration purposes. The critical value for the whole flight is the remaining fuel. So we have to constantly keep track of the current fuel available and compute the estimated fuel needed for the rest of the search and flight back to the base with a remaining reserve. First we need to know the distance from the base airport to the search entry point. The coordinates of the search entry point can be computed from the MPP coordinates by spherical geometry. Go from the MPP direction south half the grid size nautical miles and from there half the grid size to the east. We could approximate the coordinates simply by using google earth and roughly measure the coordinates. Now we can compute the great circle distance between the base and the search entry point using spherical geometry again or using google earth. Compute all fixed values like time, distance and fuel consumption for the climb and descent phases of the flight using the formulas below. Compute the cruise distance from the distance to the MPP minus climb and descent distance. Now as we know the cruise distance we can compute the total time and fuel consumption of the fligh to the entry point. Fly from grid waypoint to waypoint and compute at each point the distance back to the base. From that we can compute the cruise distance back to the base and from that the time and fuel used for this flight phase. We need to have the reserve fuel in the tank on reaching the base. So on departure from the search grid we need to have at least the reserve fuel plus the trip fuel back to the base, called Bingo Fuel. If we have still enough fuel left at each search waypoint to fly another leg without touching the Bingo Fuel, we fly another search leg. Else we fly back to the base at this point. For each search leg we add the time, distance and fuel consumption to the current values to keep track of the remaining fuel available and to compute the total at the end of the trip. The fuel consumption can be calculated with formula (3) above. The code used in this App can be examined on Source Code: Search and Rescue Mission Contest. All calculations are done in the function Update.